Who doesn't love Halloween? It's one of my favorite holidays. The costumes, candy, and spooky fun, never fail to bring out the kid in me. 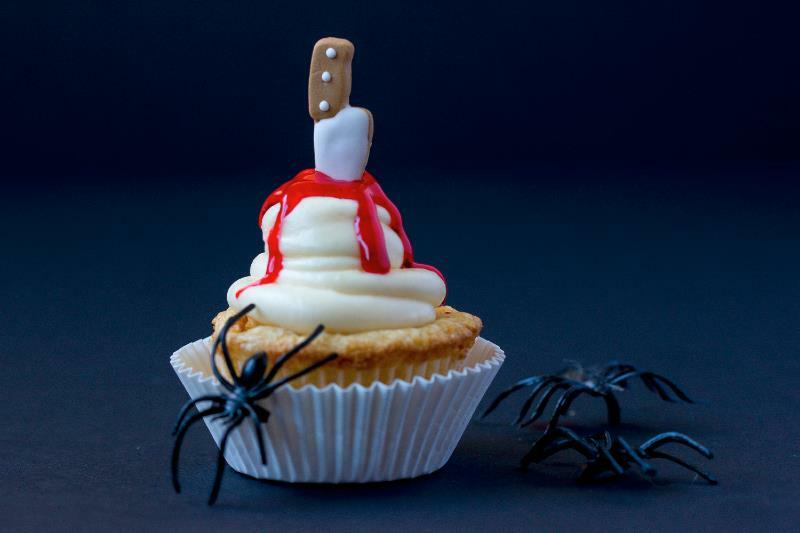 This year my Halloween inspiration came in the form of these sugar daggers by Wilton that I found at Michaels - perfect for a bloody cupcake! I kept the cupcakes and frosting white to accentuate the drama. So easy to make and such fun! One little tip- use a red writing gel for the blood (available from the grocery store ), rather than red food coloring. I found it much easier to work with. In the clean bowl of an electric mixer fitted with the whisk attachment, beat egg whites on low speed until foamy. With mixer running, gradually add remaining 1/4 cup sugar; beat on high speed until stiff, glossy peaks form, about 4 minutes. Do not overbeat. Gently fold 1/3 of the egg-white mixture into the butter-flour mixture until combined. Gently fold in remaining egg-white mixture. Divide batter evenly among the muffin cups, filling each with a heaping 1/4 cup batter. Bake, rotating pans halfway through, until the cupcakes are golden brown and a cake tester inserted in the center of a cupcake comes out clean, 20 to 25 minutes. Transfer pans to a wire rack. Invert cupcakes onto rack; then reinvert and let cool completely, top sides up. Cupcakes may be stored in a covered container in the refrigerator for up to three days. Place softened cream cheese and butter in the bowl of a stand mixer fitted with the whisk attachment. Cream together well. Add sifted confectioner's sugar and the vanilla. Continue beating until smooth and fluffy. Makes 2 cups.